The key to increasing membership for most bridge clubs is to teach the game. Our experience is that wherever a club puts together a package including teaching, gentle supervised play and carefully planned marketing, there is a ready supply of people wanting to learn. “We are now on our 3rd course and have enough people in the wings for a further course in September,” says an email from a Nottinghamshire club received earlier this week. You cannot teach bridge without teachers though, and that is why we are encouraging clubs to train more teachers. There is even funding available for EBU clubs. I am a reasonable bridge player and a qualified tournament director, but I have never myself taught bridge. Recognising its importance, I booked a place on a course at Bristol Bridge Club which took place a couple of weeks ago. The course was run by Lorna Watson, who is also the manager of EBTA – the English Bridge Teachers Association. Bristol Bridge Club was founded in the fifties and has its own premises, formerly a printing works but the home of the club since 1981. The facilities are excellent, and I turned up with 8 other students early on a Saturday morning to be greeted with coffee and biscuits. Yes, it meant giving up a weekend: the course is quite intense and runs for two full days 9.30am to 4.30pm or thereabouts. Lorna started us off with an icebreaker (“Name songs with a suit of cards in their title”) to get us chatting and then got us to think about different styles of learning. Do you learn best by seeing, hearing, or trying for yourself? The important point is that everyone learns in different ways, essential to keep in mind when taking on a group of students. We looked at designing a course. You are not going to get far without a clear plan for each lesson. Fortunately EBED has devised some fantastic materials to help us to teach this wonderful but challenging game. Yes you can go and devise your own materials if you have the time and the skills, but for most of us being able to base our courses on material tried and tested by others is a huge advantage. Beginning Bridge Book One: a course for complete beginners. It has 8 chapters but you are not expected to cover a chapter in just one lesson. Three or four lessons per chapter (on average) is more typical, which gets you through the course in around 30 weeks, perfect for a one year course with some holiday breaks. 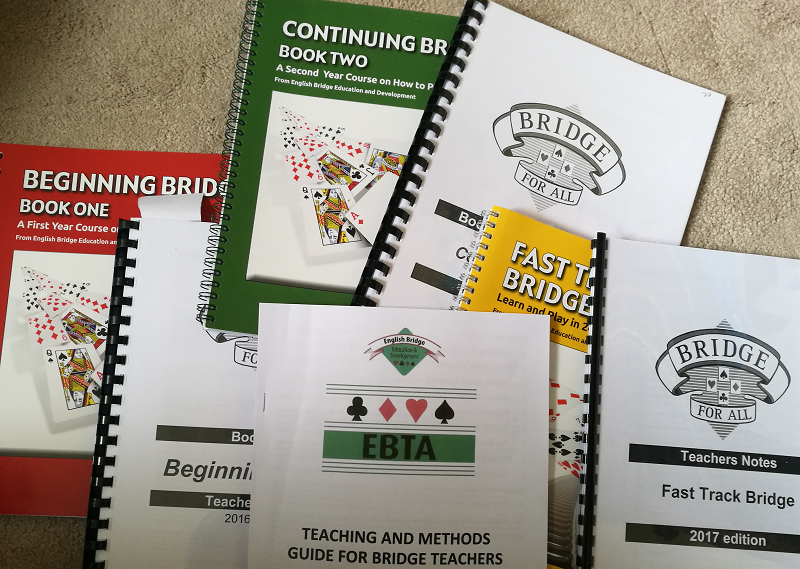 Beginning Bridge Teachers Notes: an essential guide to how to teach the course, including notes, tips, exercises and practice hands. 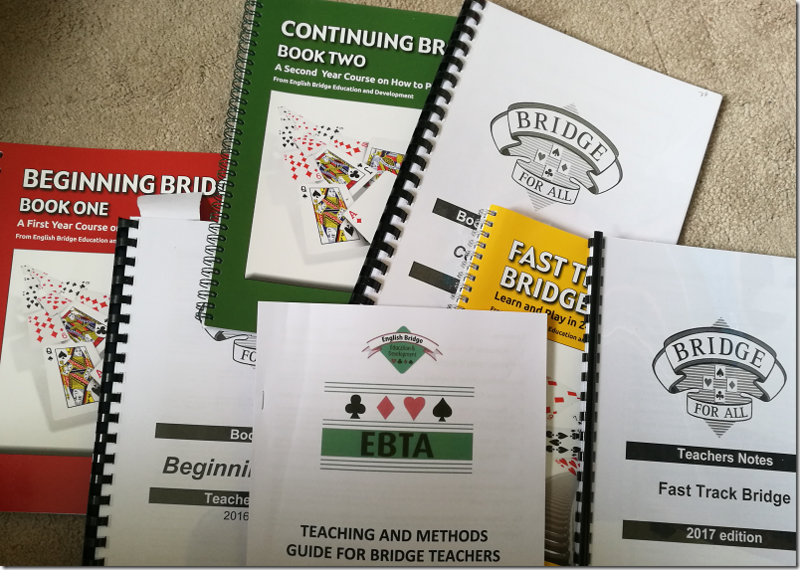 Teaching and Methods Guide for Bridge Teachers: general advice and guidance on how to teach bridge. Covers techniques and activities, how to plan a class, how to make classes enjoyable, what visual aids you need, and how to assess progress. Today we cannot assume that people have experience of card games or how to handle a pack of cards. Most of us will also be teaching adults, and no matter how enthusiastic, we all tend to learn more slowly when we are older. It is important therefore to take it gently, explain everything that needs explaining, and to go at the right pace for those learning. Next we played some Minibridge, which is a simplified version of bridge that has no bidding. You can learn it very quickly and it is fun to play. The rest of the day we looked more closely at the Bridge for All materials. Bridge for All is a method for learning duplicate bridge, based on a simple version of Acol, the most commonly used bidding system in England. There are two distinct Bridge for All paths, one formed by the book Beginning Bridge and its successor Continuing Bridge, and the other consisting of Fast Track Bridge, where you can learn the game in 12 two-hour lessons. Which to choose? On this course we essentially learned to teach with Beginning Bridge. Fast Track is more intense. It is nice to make faster progress, but only if the students really are keeping up and taking it all in. Opinions vary and this is something that merits careful discussion if you are planning a course. Bridge for All is quite prescriptive. It is based on a single bidding system and while there is some slight flexibility, for example if you decide to teach weak two opening bids, there is not much. The general thought is that novices have enough to do learning the basics, and it will not help to burden them with more decisions than necessary. The philosophy is to teach them one good way to play. One thing I will never forget is Lorna insisting to the group, “Show them the cards”. What she means is that whatever you are talking about, from balanced hands, to five card suits, to leading out trumps or taking a finesse, almost always makes more sense when accompanied with a hand of cards that everyone can see. Lorna had some giant cards with magnetic backs that you can stick on the right kind of board. You can also use hand records and have people look at hands in small groups (we were shown an easily taught technique for recreating hands from hand records). This means that for teaching bridge some way of displaying hands is a big advantage. Of course you may be able to use a laptop and a projector instead of giant cards. Day two kicked of gently with some open Q&A and a session on how to recruit students for your classes and how to get them playing, eventually, in normal club sessions. A key topic. We also looked at the EBTA online Teacher Zone and some handy tools like the Hand Generator which makes it easy to create annotated hand records in Microsoft Word. The big deal (ha!) on day two though was the simulations. Each of had selected a topic and were give 5 to 10 minutes (in practice it seemed to take a bit longer) to teach it to the rest of the class. Topics ranged from basics like the concept of Trumps, to trickier subjects like Stayman. I picked Responding without a fit to a 1 level suit opening. For an experienced bridge player, what could be easier than explaining Stayman? Many things, as we soon discovered. I think it is fair to say that most of us found the simulations more challenging than expected, however well prepared we were. Many things go through your mind. Am I speaking loud enough? Am I using jargon? Can everyone see the board or screen? Is this making sense? It is easy to get bogged down in over complexity, like Stayman edge cases where the responder holds 5-4 in the majors. Keep it simple, said Lorna, and show them the cards. I was most grateful for my two days in Bristol, even though it was humbling. Simply knowing how to play bridge does not make you a good teacher. Teaching is a skill of its own. That said, I feel vastly better equipped to take on the task having completed the course. I would encourage anyone who has in mind to take on a bridge class to do the course; it is likely to be well worthwhile. The next stage of the course is to teach. There is no substitute for experience. What EBTA does provide is a network of teachers including the support you get by belonging to a community, including an online discussion forum and an upcoming teacher’s conference June 14th-16th in Milton Keynes – more details here. By teaching bridge we do a real service not only to our club but also to the community, a thought which makes the endeavour richly worthwhile. If you want to book a course you can see upcoming courses here. I will be writing on this site about ways in which clubs can become more attractive to new members. This is another aspect of membership development, which is not just about getting someone to visit for the first time, but also about making a club a great place to enjoy a session of bridge. Today the topic is directing. Although not directly related to membership, there is probably nobody more important than the director for making everyone feel at home and that the club is friendly and well run. I am not going to pretend this is easy, but in the perfect bridge club it is no burden to call the director, because you know they will do all they can to be helpful and resolve issues with fairness and sensitivity, listening carefully to both sides if there is a disagreement, being well informed in terms of the rules of the game, and having abundant common sense, knowing when to apply the laws with rigour and when to make allowance for issues of health, circumstance or novice players. Of course there is more to directing than being called to the table. In fact, summoning the director is relatively rare in my experience, and in many sessions does not happen at all. The director also does a lot to set the pace of play, ensure a quiet environment, and make sure that players of all standards feel welcome. In an ideal club, there is a mutual respect between the director and the club members. The director knows they are there to help members have a lovely bridge session, not to bark at them or make them feel guilty for small infractions. Equally, the members do their best to follow the director’s guidance, to respect the decisions the director makes, and to remember that the director is a volunteer who may occasionally get things wrong. The director’s opening remarks do a lot to set the tone. Visitors are welcomed by name. Successes are celebrated, but notices are brief and the focus is on getting play under way promptly. Now there is a tricky issue here, which is what a director should do when a player has correctly pointed out an infraction that merits a ruling such as a score adjustment, but on the other hand the person committing the infraction is a novice or someone easily confused, while the person calling is a capable and experienced player who generally scores near the top. The English Bridge Union regulates the game in England and part of that role is to ensure as far as possible that bridge is played by the rules, which are carefully set out in the laws of bridge and supplemented by EBU-specific regulations and guidance. The most important thing is that the director sets the right tone. Perhaps there was a hesitation, an incorrect explanation in the bidding, or a revoke. We all make mistakes and the director is there to put things right so that the there is no disadvantage to the pair that did not commit an infraction. In cases where there is an imbalance of skills as described above, the director must make the correct ruling, but in a manner that is highly sensitive or even apologetic to the person who made the error. “I am sorry because I know you did not intend to misplay, but the rules of the game require me to adjust the score.” There should not be anything in the director’s manner that suggests unfriendliness. Equally, it is not wrong to encourage a culture within a club where members are encouraged to make allowance for one another and not to take advantage inappropriately. This is a difficult judgement and may go against our competitive spirit on occasion; but what is more important, your score on one board,or the reputation and atmosphere at the club being friendly and welcoming?